Over 500 houses in Hong Seng Estate in Penang may soon have to make way for a new housing project. A resident who has stayed there for 30 years said he heard about the plans to redevelop the land but did not have any details. “This is my ancestral house. If the offer is good, we may accept it,” he said, adding that they were paying RM40 rental per month. Hong Seng Estate located off Jalan Mount Erskine was named after the original owner who purchased the land, which was then a jungle, in 1819. Hong Seng, who is buried there, had wanted to turn the land into a graveyard plot for his family. The land is now surrounded by 50 family ancestral graves and backed by lush greenery. 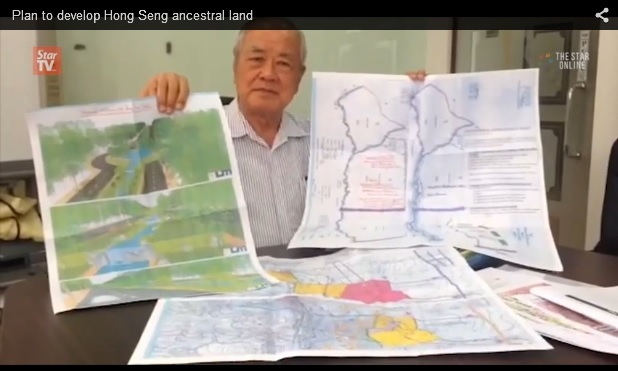 According to former state executive councillor Datuk Khor Gark Kim, the administrators of the land spanning 62 acres approached him about the development project. “Many developers had been invited to develop the estate but to no avail, partly due to a lack of legal access. “The administrators then asked me if I could redevelop it since I was the assemblyman for Tanjung Bungah,” he said at his office in Midlands One-Stop shopping centre in Burmah Road yesterday. Khor said he met with Chief Minister Lim Guan Eng twice last year about the plan, adding that Lim thought it was a good idea. The project will have low medium-cost (30%), affordable (25%) and open-value (45%) housing. “The residents will each be given a low medium-cost unit with three bedrooms and they will also be compensated with rental subsidy for three years while the project is ongoing.